Get The Real Power is a project of DJ Wondermike. The project was made of the rapper Split Image (Michael Williams) and the female vocalist Tina Safrany (more well known for being the performers featured by First Base , the most well-know project of the same producer). 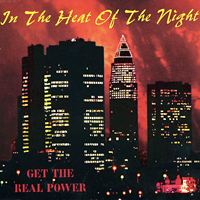 In the Heat of the Night was released as maxi-CD featuring 5 versions. Music was composed by Mike Wonder and Mr. Cobra, lyrics were written by Tina Safrani, Mike Williams and Stennis Brandt. All tracks puplished by Hanseatic, Edition Just Published, mixed at High-Outpu Studios, Offenbach by DJ Wondermike. Coverdesign was done by Chris Zimmer (MMS Grafix).